Is Don getting a clue? This week he seemed intent on cleaning up his act in general, and sobering up in particular. He even started keeping a journal. I immediately wondered if this was part of some organized get-sober campaign, but perhaps he was inspired by discovering that Roger is writing a book. Anyway, as Don struggled to redefine his place in the world, Joan tried to hold on to spot in the SCDP hierarchy. 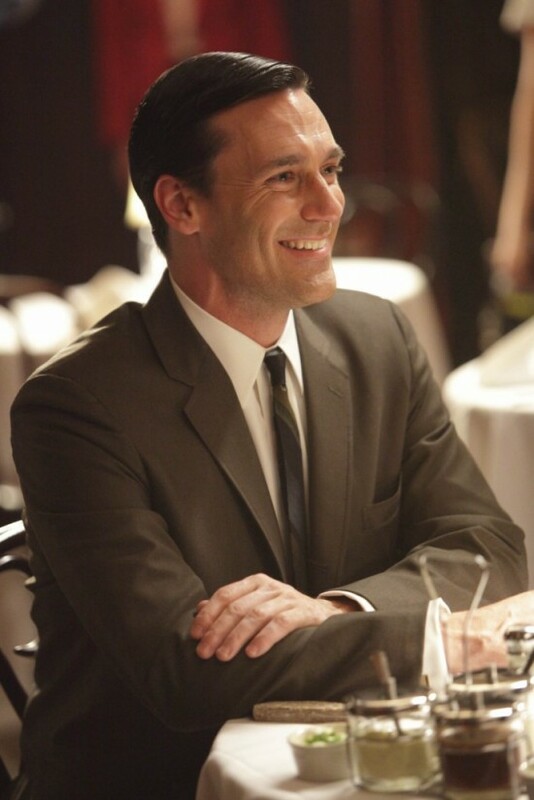 Don (Jon Hamm) wrote his journal longhand because typing felt like work (Don’t I know it, brother!). “Gain a modicum of control over the way I feel. I wanna wake up.” One of his first observations: They say as soon as you have to cut down on drinking, you have a drinking problem. As I have been noting all season, he certainly has been losing his touch. Throughout the episode, Don was aware of people drinking casually at the office; aware of the bottles on his sideboard. He tried to resist with coffee. It seems that he also began swimming, at the New York Athletic Club (a real place; an uncle of mine used to work there), but he was coughing after swimming just one pool length. Undaunted, he fired up a smoke the second he stepped outside the building. And since this is 1965, waiting until he was out of the building was actually a remarkable act of restraint. For a world full of strangers, there was an awful lot about HELLCATS that was familiar. It would be easy to compare The CW’s new cheerleader drama to ABC Family’s MAKE IT OR BREAK IT — so I will. Provided I can also point out the similarities to Fox’s GLEE. HELLCATS follows Marti Perkins (Alyson Michalka, of the pop group 78violet) a hard-working law student on scholarship at Lancer University who is so poor that she has to ride her bike everywhere (What, you thought she was just being green?) Marti’s opening narration tells us that she depends her scholarship for tuition and housing, so when it is canceled (for reasons that were never quite clear to me) she’s in a bad way. Directed by the campus to look into “unconventional scholarships” from “odd little groups,” Marti discovers that a cheerleading scholarship is available — and the Lancers coincidentally just lost Alice (Heather Hemmens), one of their flyers.